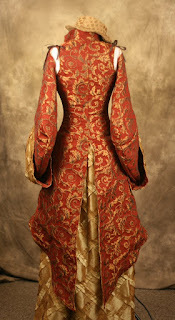 To tell you the truth, I think I might be a little jaded on bodices. Not that I'm sick of them or anything, but I've made so many (I'm guessing the number is up around 3000 since I started this company when I was 17) that I hardly ever IMPRESS myself anymore. I still love them, and believe in them with all my heart, but I'm fairly used to them. It's sort of like my husband when he sees me in a bodice. He sees it so often, that I usually get the "You look fine" kind of response. Most husbands that come into my booth with their wives and see them in corsets just salivate. That's amazing! You're so talented. my goodness!! I love the Pirate Coats and plan to have one. But now I want one of these too.. Simply stunning! Absolutely beautiful - as all of them are. :) Loves! Might be a silly question, but. . .are you making those hats and where can I get one? I've been looking all around for one like that! At least that doesn't cost >$100. That is the hotness and SO elegant! You'd have to be the Pirate Queen. Looks like I'm going to have to do the same thing. I don't mind putting in the time. I'd almost rather do it that way to feel more accomplished. I knit up a hat, but it wasn't the shape I wanted. Trail and error. . . Thanks for letting me know! Do you realize what you have done to us! None of us will be content without that! You know you have really affected me. I went to the fabric store with my mom this week to get quilting stuff and I found myself looking at the tapestry fabric and imagining skirts. I would have bought up a bunch if I had the dough with me. I think skirts all the time. I am going to have to make myself a fancy one. Do you know I don't own one yet. Isn't that ironic?! This is so mind-blowingly beautiful, I cannot even begin to tell you how brilliant you are. I've only learned about your work today, but I'm already devising schemes to get my hands on some money and offer you custom! I began salivating over that, too. one of my friends sent me a link to your site - I think your work is gorgeous. I very much appreciate your commitment to quality and detail, and I'm sure I'll be a happy customer in the coming months. This particularly made me chuckle: "Please, women, wear bras. If you hate them and think they’re uncomfortable, then you’re probably wearing the wrong size. This is something else that I could write a whole novel on." I can totally relate! Also, your family is gorgeous. You are truly blessed. Two days after I stumbled upon your website, I was lusting after a Pirate Coat. Then you directed me to this and I've already put in my order! LOL. What can I say, it was love at first sight. I was certain that if I didn't have a Peacock Pirate Coat I would simply curl up and die. But of course...what's the coat without the whole outfit? LOL. So for good measure I got the whole thing! Can't wait to put it on! I just have to say this is my ultimate dream in an outfit. ULTIMATE. I love your work, and i definitely know what its like trying on a bodice that is made all wrong! But your stuff is gorgeous! I cant afford it, atleast not now, but i definitely will bookmark your page and salivate over it again and again. 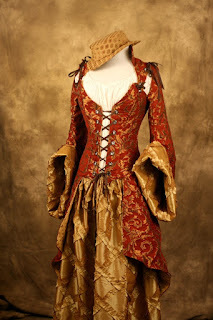 im drooling, corsets are pretty boring, but a lot of people likely cant afford the big fancy outfits. What a brilliant colour, sleeves! Ooooooh yeah. That outfit is perfect. 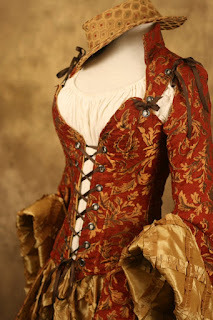 Luckily for me, I'm still boggled by your gorgeous bodices too, but this is just even more eye candy. Oh so lovely dress style you have been shared. Thanks a lot. This Peacock Pirate Coats is dazzling. Thanks.